The highly innovative Secuflow fume cupboard with supportive flow technology for optimum flow regulation requires an extract air volume of only 270 m3/h/lfm while operating safely. This significantly reduced energy consumption makes laboratory operations even more economical. 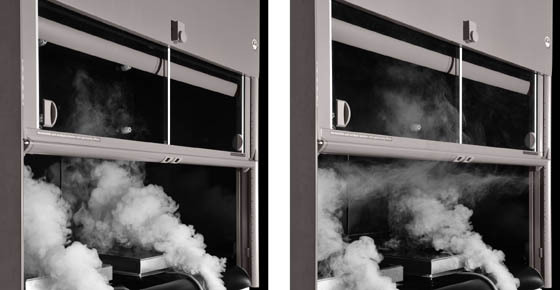 With the Secuflow fume cupboard, supportive air is systematically directed into the internal workspace from the aerodynamically designed sill on the side panel and along the worktop. This prevents turbulences and perfectly stabilises the inflow air. The Secuflow fume cupboard is a perfectly coherent product which has passed all final EN 14175 and ASHRAE 110/1995 tests with excellent results.